If you want to use your pool throughout the year and are looking at ways to heat the pool during the cooler months or maybe you live in an area where the pool water is always a little too cold for swimming – a solar pool heater can help you. Depending on the weather and climatic conditions in your area, you can expect a solar pool heater tor raise the temperature of your pool 5 to 15 degrees Fahrenheit over a period of some days with sunshine. Water that passes through the solar pool system only once can be raised 2 to 5 degrees Fahrenheit. Most people spend a fortune each month heating their pools making it an enjoyable swimming experience for the whole family, but solar pool heaters offer you the ability to heat your pool in an affordable way, using the natural resource of the sun, reducing emissions and being completely environmentally friendly. Over 790,000 solar pool heaters are being used in America, more than any other solar energy system. Step 1: Make sure you have everything you need. Step 2: Decide where you want to place your solar collector. Step 3: What size does you solar collector need to have? Step 4: Build your solar panel? Step 6: Connect to your pool? Solar Pool Heaters use the heat of the sun to warm the water in your pool. If you live in an area with the necessary duration of sunlight and if you choose the right product – a solar heater can offer you the same results you would get if you used electricity or gas for heating. The majority of solar collectors are made up of solar panels, tubes and pipes. It’s suggested that the solar panels are at least half the square footage of your pool. The panels need to be strategically placed where they get maximum sun exposure, this can be on the roof of your property or near the pool. The panels need to sit at an angle to ensure they get maximum sun exposure throughout the day. The water is then pumped through the filter and through the tubes and pipes to the solar collector and then pumped back into the pool, the water is warmed as it goes through the pipes and solar connector offering you warm water. The filter is essential in any pool, it collects any debris and requires cleaning on a regular basis. It reduces your pool getting dirty so you can enjoy clean water throughout the season. If you already have a pool you can most likely use the existing filter. The pump circulates the water through the heating system, ensuring you always have warm water at the desired temperature. As with the filter you might be able to use your existing pump if you already own a pool. The pump has to be strong enough to pump the water to the solar collector – and depending where this is you might need a more powerful pump. The Solar Arc is a swimming pool heater that is very compact and gets warmed by the sun. This product is smaller than other heaters and therefore takes up less space. I appreciate that it is easily directly installed to the existing plumbing system. Also, there is no need for using by-pass kits as it has a hi-flow design. The product has built-in legs that make it very flexible to position and set the most appropriate angle for the sun to penetrate. It also comes with hose fittings 1 1/4 – 1 ½ inches and Intex adaptors that facilitate installation. The increase in the pool temperature cannot be compared with an electric heater. Expensive for large pools as more than one may be needed. The Fafco Deluxe is an above ground solar heating system with 2ft x 20ft panels. It can be a great choice for those who require to fit the system in different locations. This is because it can be mounted on the ground, on a nearby roof or on a rack. Another good feature is the UV-resistant polyethylene building which makes it durable. It is one of my favorite solar pool heaters because it is extremely efficient and lasts for a long period of time. The product comes with economical headers that are 1-1/2-inch. The product works well together with a solar blanket and may be able to raise the temperature by 10 degrees or more. It always runs when the pump of the pool is operating. Sometimes the product is poorly packaged lacking an instruction manual. The Blue Wave is a curved heater that uses the concept of solar heating domes. The curved shape design considerably lowers the amount of time taken to heat the pool. This is possible as maximum heat absorption takes place. It also helps to increase the heating capacity by 40% in every cycle. The product is best suited for pools above ground, 30 feet round with a capacity of 12,000 gallons. It comes with an adapter, 2 hoses and stainless steel hose clamps for installation. Another great feature is the collapsible base legs that allow for easy adjustment and movement. 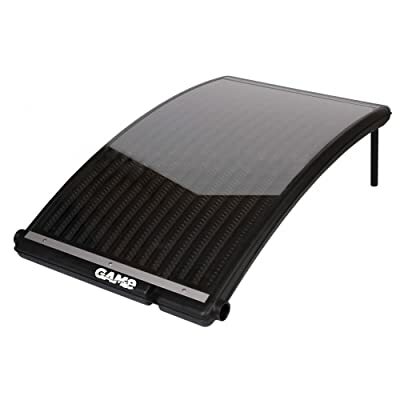 This solar pool heater fits into a hose fitting of between 1.25 to 1.5 inches. It might be able to generate heat that raises the temperature of the pool by 5 degrees in a period of 5 days. Requires a by-pass kit to generate more heat leading to an additional expense. The Solar pool panel system is a product of SunQuest. The pool heater cab be used for both in and above ground swimming pools. This is a really useful feature as most of the solar pool heaters are designed for above ground swimming pools. It is designed with 2 inch OD headers that are capable of achieving maximum flow. It is important to consider using this product as it provides a better system of water circulation. Also, there is minimal back pressure on the pump. Like the many solar pool heaters, it can be easily integrated with existing plumbing. The system can increase the temperature of pool water by up to 10 degrees. The product comes with connectors which are standard to connect to the hose. High-quality, durable and very reliable. Used for both in and above ground swimming pools. Expensive when compared to other solar pool heaters. The Solar Bear is made of U.V. stabilized polyethylene. This makes it very tough, and durable as it withstands wearing out. The system comes with 2 6-ft long 1.5-in diameter hoses, 4 feet x 20-ft extra-large solar collector, 4 clamps and an integral bypass valve. The bypass valve enables turning on and off of the system. The clamp and hoses allow the product to be connected to the filtration system. This product may be fixed on a rack, roof or the ground. All the necessary manuals and extra hardware to install the system is provided for smooth operation. Access to sunlight between 10 am and 4 pm allows for optimal heating of the system. The solar Bear performs optimally when set up tilted in about 10 to 30 degrees south. The system may be mounted on the ground, on a rack, or a nearby roof. Made of high-quality U.V. stabilized polyethylene. Comes with an easy to follow user manual. The product has a 10-year warranty. Does not work optimally without constant supply of sunlight specified. Kokido Keops Solar Dome is a solar heater for above ground pools. The product works by being connected between the pump of the filter and return. It comes with fittings, 4-foot hoses and stainless steel clamps for installation. It also comes with a cover that serves to protect the system during storage. The system works efficiently when the heater is placed at an angle. The integrated rack part of the product becomes very useful as it helps to set an angle for maximum sun exposure. It is suitable for relatively smaller swimming pools but additional heaters can be added to larger pools. 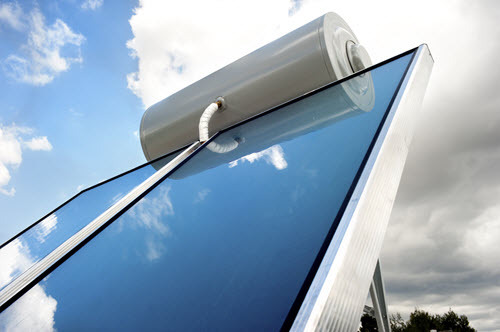 In its basic description, solar pool heating works by pumping water through tubes designed to collect solar energy. This water is heated and then circulated via your swimming pool pump back into the pool. There are a variety of options and methods for installing these “tubes” ranging from pool side for an above ground pool to being installed out of site on a roof top of pool house. The next element that can be added to the solar heating system is called an Actuator which is a valve to control how much hot water is allowed into the pool. This system works with a thermometer set up to tell the actuator valve when to let the warm water into the flow of the circulating pump water. The valve concept works by putting a 3 way T system in the pool circulation system – and when the thermostat detects the temperature dropping, it opens the valve to let in the hot water heated by the solar tubes. With out this type of device – the hot water produced by the tubes just continually circulates into the pool and can make the water too warm for a refreshing swim on a hot, sunny day. What type of solar pool heating system you will choose for your home? Will you install it yourself or hire a professional to do it for you? What size is your pool? Bigger pools require a bigger solar system? To give you a basic idea on what you can expect to pay, we have broken down the costs across the type of pool heating systems available including accessories. Once the system is installed you should expect zero operational costs – but bear in mind that there might be some costs for repairs and maintenance. The solar panel systems are probably the most popular for larger pools, the panels can be mounted on the roof or ground next to the pool. These are normally installed facing to the South to get the most of the suns exposure throughout the day. The solar pool heating systems that use panels can start as low as $140 and can go up to $2000 or more for a standard sized pool (for instance 15 x 30 ft. oval pool or 24 ft. round pool) – depending on the brand and the system. If you want to hire a professional to install your system you can expect total costs between $3000 and $7000. The dome solar pool heater is designed for above ground pools and comes in a compact design. An advantage of the dome heaters are that they require less space than a solar panel and can be installed next to the pool by yourself. In fact these Heaters are made for DIY installation. The systems are affordable starting at around $90. 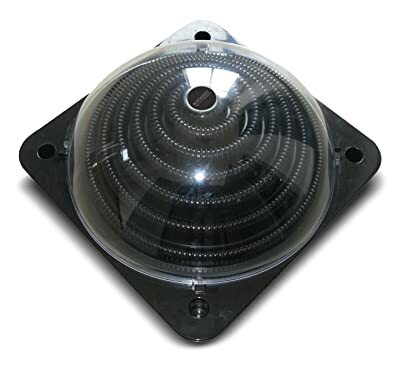 We recommend Dome Style Heaters for smaller pools and if you do not have the space to place a full solar panel. If you want to heat bigger pools using Dome Style Solar Heaters you can connect two or more in a row. 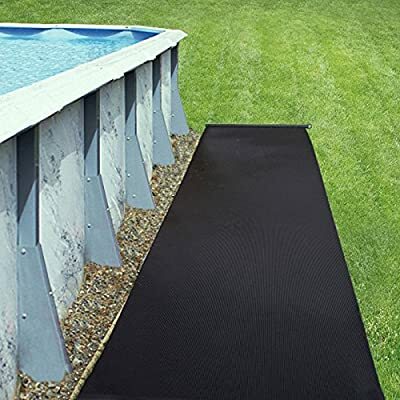 Solar pool covers tend to be the most popular because they are convenient and easy to use. There is no real installation and they are an affordable choice ranging from $150 to $250, depending on the cover you choose. These covers are a great choice though they may not be as effective as a regular solar panel systems. The covers simply float on the water reducing evaporation, increasing heat and eliminating debris, ensuring you have a clean and warm pool. Ring systems are also very popular. These rings are inflatable and also float on the water like a cover – just being smaller. You need to ensure at least seventy percent of your pool is covered and the rings hold together using magnets. The rings are easy to put in and take out of the pool, one person can lift them with ease. These range between $25 and $32 per ring. 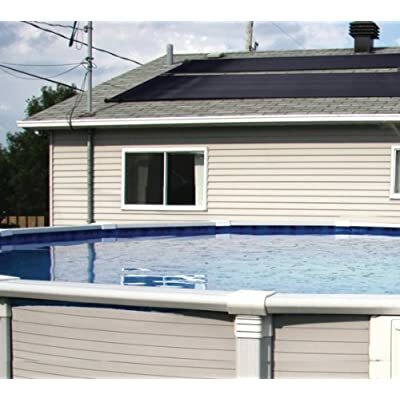 Both options – Solar Pool Covers and Solar Pool Rings – are great as an addition to a Solar Panel System. There are a number of accessories you may need when installing a solar pool heater on your own in your property from diverter Valve Kits ($30) to optional Adapter Kits ($20). Roof mounting kits are popular helping you secure your panels to the roof, these cost around $30 and you might need more than one depending on the size of the panel. Then there are the bypass kits at $60 and the host adapters at $15. 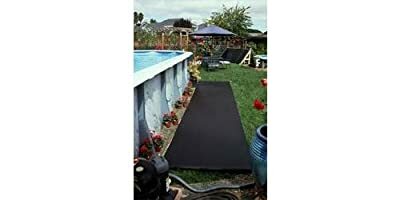 If you have chosen a solar pool cover and you want the convenience of rolling the cover on and off with ease, you can use a cover roller system which starts at around $60. Overall it’s important to bear in mind that once you have paid the initial costs and your solar pool heater is in place, you will have no overheads. Most people find they have a return on their investment within a few short years. Tips to consider when buying a solar heater for your swimming pool. 1. Buy enough capacity. Many people try to cut corners with how many panels to purchase to heat their pool. If you buy the same sq ft of panel area as your pool you will be close to the calculated value. Then add another panel to get a little more heat. 2. Buy panels made of a material that has good solar mass like the Vortex solar pool panels. 3. To increase your swimming season in colder climates buy a pool heater. The panels can pre heat the pool water before the heater and saves work for the heater. You want to build a Solar Pool Panel or entire Heating System on your own? That can be a very cost-effective way for you to heat your pool and extend the swimming season by a few months. 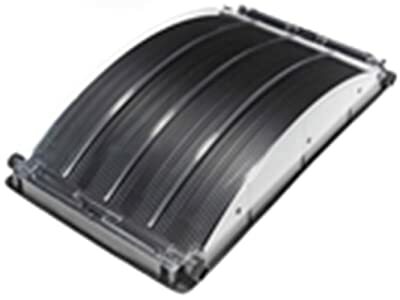 A solar heater is a great choice which is not only low at cost but also has a low environmental impact. And when you can save thousands of Dollars doing it on your own: why not build your own solar pool heater and use it at no cost by harnessing the free solar energy from the sun? Done right, a DIY Solar water pool heater offer a long-term performance with very low maintenance just like professional equipment does. All in all: a thoughtfully installed DIY Solar water pool heater provides great advantages as compared to standard installations by a contractor. You can easily stretch your dollars in the smart way by substituting brains for bucks. 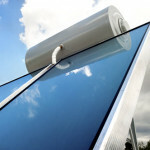 Hiring a professional to install the solar pool water heater can be a costly affair. If you choose to hire a local installation service you would need to spend at least US$ 2.000 (including the solar panel). This is the absolute minimum and you will most likely get the cheapest (and that means: not very long-lasting) material on the market. Costs can go up to US$ 7.000 – 10.000. The price does not only depend on the material and labor, but also on the location of your pool – which is an important factor. If your site is located in a colder climate you will need a bigger panel. Of course the size of your swimming pool plays an important role as well, because the bigger the pool – the bigger the solar panel has to be. have at least a basic knowledge how to build something. If you consider yourself a DIY professional you will have no problems at all. For getting the best results, the solar collector has to be installed in the location where it will have the maximum time of sun exposure during the day. The ideal setup would be to let the solar panel face directly towards the south. The best place to install is to put it on your roof, because rooftops usually receive the most direct sunlight. You can place it in your backyard as well where you feel it will get direct or unobstructed sunrays. Besides the sun, another factor should be taken into consideration when deciding on the location: wind. Wind can cool down your panel significantly and therefore your site for the solar panels should not only be sunny, but also sheltered from too much wind if possible. if you live in a location with lots of sun you will need a smaller collector than in a colder area. how warm would you like your water? The warmer you want your water – the bigger the collector has to be. If you have a pool above the ground your loss of heat will be greater. Depending on these factors you should have a good overview what size your collector should be. It is also helpful to talk to someone in your neighborhood that already has a solar collector about their experience. At least 50 ft. of black hose pipe. Use high quality drinking water hose in order to have a solution that lasts. It is actually very easy: First place place the wooden board on the ground and attach as much of the black hose onto the board using the nails or screws. A good way to do this is to coil up the hose in circles. You can see how this can be done on the picture on the left. By placing as much of the hose onto the board you make sure that the exposure to the sun is at a maximum. You should then use the black paint to color the board with the hose. The darker the board – the more heat it will absorb from the sun. Once the pain is dry you should put the panel up. If you connect your panel on a roof please have in mind that – once the panel is filled with water – it will get heavy. So you should make sure that the place of your choice is stable enough to hold the weight. After the cold water is pumped out of the pool and through the filter the solar panel will heat the water in the hose. If you use your old pump please remember to check if the pump is strong enough to pump water through your new solar panel and back into the pool. If you want to use two or more solar collector panels, connect them in parallel. A valve should be installed between the filter and the solar panel – allowing you to decide if you would like to use the solar panel for heating and therefore controlling the temperature. When the valve is closed, water should run exclusively through the solar collector panel, heating the water. When you open the valve, no (or less) water flows through the collector panel. Once you have installed the Panel: have fun with your new Solar Panel. Many solar pool heaters offer DIY kits enabling you to do the installation yourself. The majority of people hire a professional to do the installation for them, but if you are doing the installation yourself, there are some accessories you may need to complete the job. Before looking at the accessories in order to have a solar pool heater you will need a pool filter, pump and solar collector, such as solar panels. Each of these work together to offer you warmer water which is a welcome addition to any home. The pump is essential in pumping the water from the pool through the filter to the solar collector and back to the pool, this ensures your water is kept at a pleasant temperature. The filter removes any debris from the water while your panels will soak up the energy of the sun, using natural resources to heat the pool. Of course this isn’t a quick and easy job, but is possible for anyone with a bit of DIY know how. If you want to place your solar panels on a roof you will need a roof mounting kit. The roof is the best place, ensure they are south facing and that they are placed at the suggested angle to capture as much sunlight as possible each day. The roof mounting kits help you ensure your panels are securely fastened to the roof without causing any damage and holding them in place even in bad weather. You’ll need adequate piping which will run from your pool pump and filter to the solar collector. It is suggested to place a three way valve on the piping allowing the water to flow freely to the panels and helping you control the water flow. Don’t forget the grommets to hold the pipes in place, you’ll want to ensure the pipes are placed and tightened down neatly to avoid any accidents or trips. Finally you may want to consider a thermal switch, this isn’t essential though is a welcome accessory which can help you ensure your pool is kept at your required temperature and avoid overheating. This may sound obvious, but if you have already bought your solar pool heating kit and your roof mounting kit, then all you need is the piping and maybe some of the valves, depending on what the kit contains. Follow the instructions to the letter, take your time to ensure each piece of piping is securely fastened and that your solar panels are correctly mounted. Bear in mind you need your solar panels to enjoy at least six hours of sunlight each day which means the angle you mount them at needs to be taken into consideration. The pump you use should be able to pump the water with ease through all the piping to the roof and back down to the pool again. T-pipes, valves, thermal switches and grommets are all essential accessories to ensure your solar pool heating system is fitted and works correctly. Solar pool heaters facilitate the maximum use of pools all year long despite the season. They also ensure minimal energy costs are incurred to heat up pools by making use of available solar energy. Before choosing a solar pool heater, it is important to consider the efficiency, durability and cost. Among the discussed solar pool heaters, I would recommend the use of the SunQuest Kokido Keops Solar Dome. This is because it can be used to heat both in and above ground pools unlike the others that are used for only above ground pools. Another great feature of the heater is that the panels are flexible to move around. Finally, the product had the least negative reviews due to its easy installation, durability and reliability.